Naomi Klein and Bill McKibben, author of the introduction to I'm with the Bears — a collection of short stories by world-class novelists envisioning the terrors of impending climate change — have written an article for The Daily Beast on the green cronyism scandals putting the environment and Obama's reputation at stake. The Solyndra solar panel manufacturer loan controversy is getting a great deal of attention in the US due to allegations that the Obama administration may have unduly influenced the loan. However, Klein and McKibben argue in this article that "there's a far, far bigger Obama cronyism scandal breaking—and in this case, there's still time for the president to step in and stop it." Cardno Entrix had in fact been contracted to run the entire environmental-review process for the pipeline. And if you go to the Cardno Entrix corporate website, it lists one of their major clients as TransCanada, the very company building the pipeline. That's almost unbelievable. However, the story took a further twist last weekend as The New York Times uncovered further details about the relationship between the two companies. TransCanada actually recommended the firm to the State Department, and that TransCanada had "managed the bidding process" that ended up picking Entrix...They quoted a Tulane law professor who specializes in environmental oversight...: Cardno Entrix had a "financial interest in the outcome of the project. Their primary loyalty is getting this project through, in the way the client wants. Conveniently, the review found that the pipeline would have "limited adverse environmental impacts", whereas the fact that 20 of America's leading scientists wrote an open letter to Obama warning that it would cause terrible damage to the environment. Furthermore, Klein and McKibben point out that the report merely gives a minor mention to the Kalamazoo River oil spill from the pipeline drilling last year, despite that fact that they were the company hired by TransCanada to assess the damage of the spill. Even though the industry bias is shockingly plain in this chain of events and the stakes are high, Klein and McKibben suspect that the scandal will go ignored. Partly due to the vested interests of the Republican party who are unlikely to draw attention to this therefore, and also because of close links between the administration and TransCanada; several big-money donors from the Clinton administration were found by the DeSmogBlog to be working for lobbyists contracted to TransCanada. Obama's year-long silence about Keystone is thus deeply conspicuous. Here's the little bit of contingent good news: The crime is still in progress. It's as if TransCanada has robbed the bank, but the getaway car is stuck in traffic. Obama can still make the arrest. If he doesn't, we'll know an awful lot about him. Maybe more than we really want to." 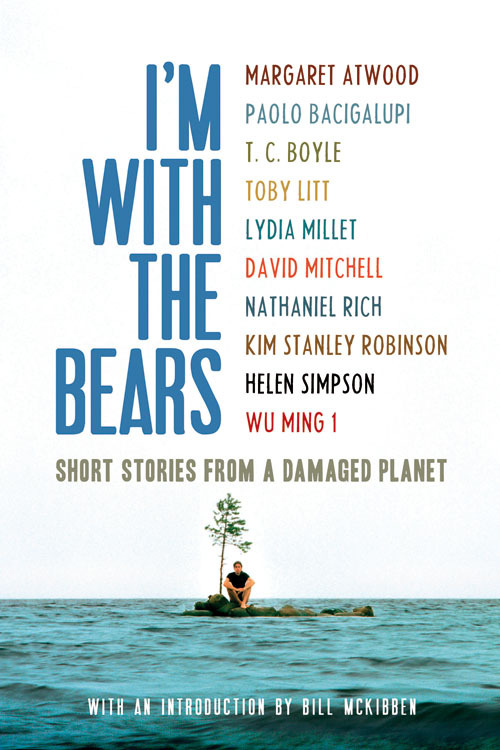 I'm with the Bears brings the capacity of the human imagination to better comprehend ecological disasters of inhuman proportions. Royalties from the sale of the book will go to 350.org, an international grassroots movement working to reduce the amount of CO2 in the atmosphere. On on November 14th contributors to the book, Helen Simpson and Toby Litt, will be taking part in The Book Stops Here, a free literary party night with book readings from the featured authors. Read the article in full at The Daily Beast and the review in full at the Guardian. To read more about their events, visit The Book Stops Here.